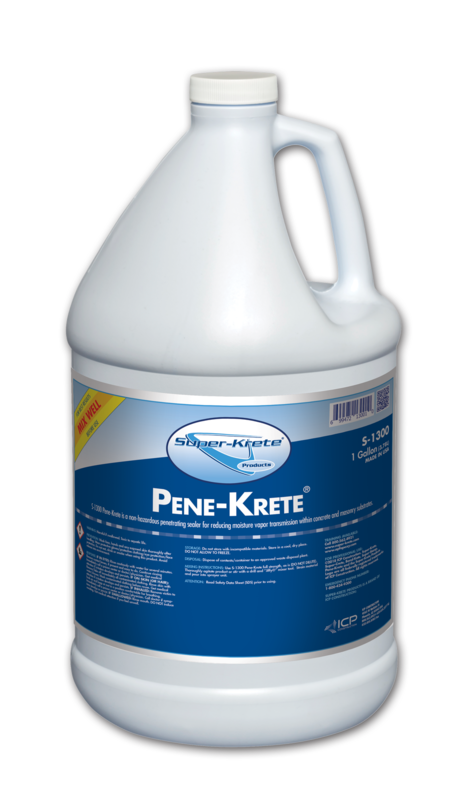 A revolutionary product, S-1300 Pene-Krete is a non-hazardous penetrating densifier for use on all concrete and masonry substrates. S-1300 Pene-Krete reacts with alkali and free lime in common cement and creates an internal crystal-like shield, increasing the strength of new and existing concrete and masonry, and reducing moisture vapor transmission. It protects surfaces from freeze/thaw damage, reduces dusting of concrete, and increases coating life by as much as 300%. Surface preparation must be sufficient to allow Pene-Krete to penetrate the surface. Spray application only.